The Santa Clarita Valley School Food Services Agency held the first of five luncheons for the 21st Annual Kids Cooking Campaign Tuesday in the agency’s central kitchen. The goal of the kids cooking campaign is to help elementary school children experience the positive social, nutritional and psychological values of eating with their family and friends, according to Santa Clarita Valley School Food Services Agency. The intention of the campaign is to make meal preparation an enjoyable and satisfying experience by teaching children safe, simple food preparation skills and cooking techniques they can use at home, according to the agency. Read the whole story [here]. I attended the lunch yesterday and it was so great! The children put on a wonderful program honoring the military. 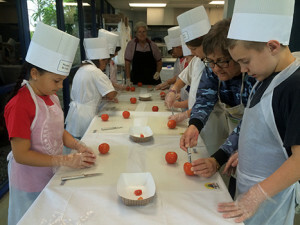 I love that this gives the kids an opportunity to cook and learn about healthy eating!